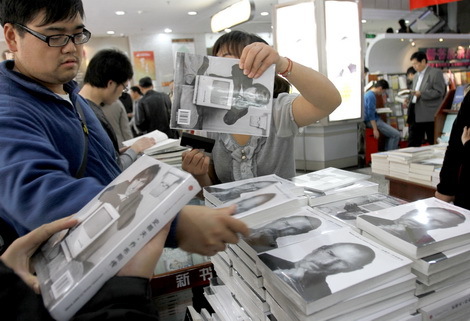 BEIJING / GUANGZHOU -Chinese readers eager to learn about the life of Steve Jobs, the enigmatic founder of Apple Inc, have lined up outside bookstores and gone online to order copies of his biography since it was released globally on Monday. The Chinese version of the book, titled Steve Jobs, hit 30 bookstores in 21 Chinese cities, including Beijing and Shanghai, at 10:05 am Monday morning as a way to commemorate Jobs, who died on Oct 5, according to a statement from China CITIC Press, the publisher of the biography's simplified Chinese edition. Liang Hui, an engineer from Guangzhou, South China's Guangdong province, said he bought the authorized biography, sold for 68 yuan ($10.60), as a way of paying his respects to Jobs. "I have been a fan of Jobs because of his bold creative spirit since my childhood," he said. "I hope the book will inspire me a lot in my job." Major e-retailers, including Dangdang and Joyo Amazon, the Chinese subsidiary of US online retailer Amazon.com have started to deliver pre-ordered copies to customers. The biography, written by Walter Isaacson, a former executive at CNN and the US magazine Time, topped Joyo Amazon's best-seller list on Monday. The book was originally scheduled for release next year but the date was moved up because of the death of Jobs, whose gadgets such as the iPhone and iPod have become a part of many people's lives. 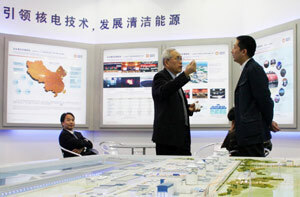 The biography like Jobs' products has been well-received in China. The Guangzhou Book Center sold 240 copies of the English version on the first day. Despite the rainy and chilly weather in Shanghai, Jobs' fans woke up early on Monday morning to queue outside Jifeng Bookstore and Shanghai Book City's two branches. In the queue at Shanghai Book City's store on Fuzhou Road, some senior citizens said they planned to buy two or three copies as gifts for family members. Xu Zhiming, president of Kuaishubao, a Beijing-based online book retailer, said his company has sold about 8,000 copies by 6 pm on Monday 3,000 to individuals and an order of 5,000 to a group-buying website. Kong Yan, the publisher's director of brand marketing, said more than 1,000 copies of Steve Jobs had been sold at a launch ceremony at the Beijing Books Building. "A teenager queued up from 5 o'clock this morning and two graduate students said they skipped classes for the biography," she said. Meng Lihua, an employee of a bookstore in Beijing Capital International Airport's Terminal 3, said the book interested even her. "I have booked one special commemorative copy that will be released in three months," she said. Buyers of the 560-page Chinese version said the biography satisfied their curiosity about Jobs, who was known for carefully guarding his privacy. Gao Li, a 30-year-old photographer who lives in Beijing, said she had read media reports about Jobs and wanted to learn more about a person who "lived a life he wanted to the most". 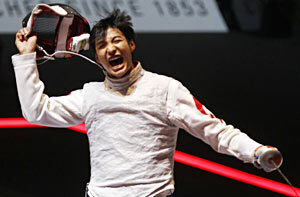 Shi Yingying, Jin Huiyu and Xin Dingding contributed to this story.